England fans are convinced the World Cup is "coming home" and if they win Wednesday, there will be little doubt in the mind of England supporters that it's meant to be this year. Crazy coincidences often give fans more hope, too, and in the case of England, a couple of interesting coincidences were pointed out after Roger Federer's shocking loss in the quarterfinals at Wimbledon. 1966: Defending Wimbledon champion Roy Emerson goes out in the quarter-finals. 2018: Defending Wimbledon champion Roger Federer goes out in the quarter-finals. 1966 - Roger Federer doesn't play in the Wimbledon final, England win the World Cup. 2018 - Roger Federer doesn't play in the Wimbledon final. 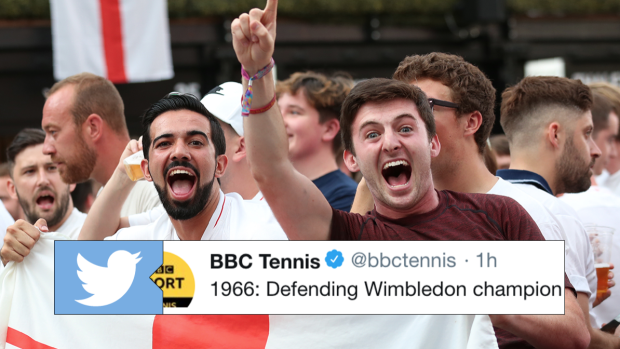 🎾 Defending #Wimbledon champion Roy Emerson goes out in the quarter-finals. 🎾 Defending #Wimbledon champion Roger Federer goes out in the quarter-finals. So the Federer not winning in 1966 and England winning the World Cup that year is quite ridiculous (considering Federer was born in 1981), but the other is a coincidence England fans can latch onto. Roy Emerson lost in the quarterfinals and was the defending champion in 1966. Federer is also the defending champion at Wimbledon and was ousted in the quarterfinals. In other words, "it's coming home."